This is a controlled burn happening on the back of the Trapps cliff. Smoke traveled down the entire Clove Valley through a residential neighborhood. Ashes were falling on a house 1/2 mile away. As stated on their website they are, "Informed by field research findings, partners collaboratively manage the larger landscape, provide environmental education, and work with local communities to preserve open space on the slopes of the ridge." Sadly, they fail this mission by leveraging local governments to change zoning laws to benefit their own goals at the expense of the local community. This has been the case in Gardiner, New Paltz, Rosendale and a town near you SOON!!!!!! With their advocates in local government, this organization has disenfranchised enough of the public that some are beginning to question weather it's worth the hassle to live around these organizations, others are fighting back. Their plan to influence local government is self-proclaimed in their own publication ﻿Planning for Nature and People: Planning Tools to Protect Open Space Around the Shawangunk Ridge﻿. "In 2003, the Partnership completed a set of guidelines that identified the key ecological communities of the ridge and the greatest threats to their long-term sustainability. These guidelines have informed the development of a cooperative, ridge-wide plan to preserve the beauty and ecological integrity of over 40,000 protected acres of the Shawangunks, while maintaining high levels of public access and enjoyment. The Partnership has identified the absence of planned fire as one of the main threats to the long-term survival of the ridge ecosystem." 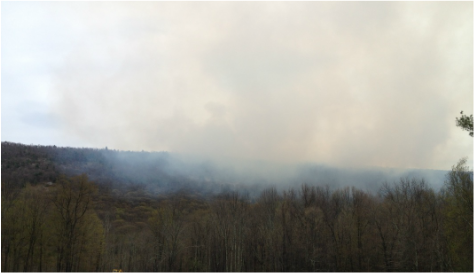 "Since 2005, the Partnership has been conducting controlled burns to protect the rare natural habitats and reduce the risk of severe wildfire on the Shawangunk Ridge." But weather this actually is happening is open to speculation since it has done nothing to curb to enormous amount of fuel that has accumulated along protected areas. What is really concerning is that sometimes entire neighborhoods are surrounded by this protected land and it is ready to ignite with the flick of a cigarette. All four (4) major ridgeline fires in the last ten years were within protected parks. And whats really scary is the fact that people smoke in these protected areas and toss their butts on the carraigeway on a regular basis. Just go for a walk on a weekend and you will bear witness to this fact. On a Sunday afternoon in May of 2016, just a week after a major fire in Minnewaska's Sam's Point Preserve, I was riding my bike up Sunset Carraigeway and counted 6 fresh cigarette butts tossed on the trail.